A Popcorn Kernel, A Little Girl, and a Crazy Father. This was a blog entry written by my husband a couple of years ago. It’s one of my favorite stories so I thought I’d post it myself. Autumn continues to keep us on our toes! 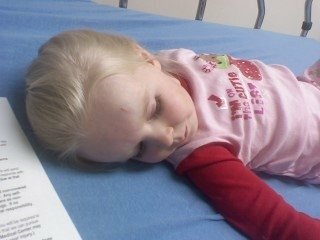 Autumn didn't seem too worried while waiting in the pediatric emergency room for the doctor. She still doesn't seem super nervous even with the doctor about to yank the little bugger from her nose. I was watching a movie with the kids last night. We do it most Monday nights while Robyn is at her meeting. Last night I made popcorn for each of them and we all sat back to enjoy the exploits of Indiana Jones. I had a fedora on–I’d worn it all day because of my lack of a hair cut and desire to look better than a trucker, which is what I look like when it gets too long, kind of sticking out like wings under a baseball cap–and Autumn kept coming by and saying, “Be Indiana Jones,” so I would talk in a funny voice. She wandered around–after all, the exploits of Indiana Jones aren’t exactly three-year old material–and while I was feeding August, she came by with something in her hand. “I’m going to put this in his nose,” she said. “Uhm, no you are not,” I said. “Okay, I’m gonna put it in my nose,” she said. “You did not. Autumn. You did not do that. You did not put that in your nose. Did you? You did? No, you didn’t.” Was I trying to convince her or myself? But by the look on her face I could tell she was telling the truth. And suddenly, the adventures of Indiana Jones were nothing compared to the adventures of Kernel in the Nose. I handed the baby to Austen and picked up Autumn as quick as I could, carrying her to the couch and holding her head back. “Do. Not. Move,” I said, holding her as tightly as possible. There it was–stuffed way up beyond the nostril, all the way into her right sinus cavity. My mind was racing. I wondered if I could just pick it out–like I do when she gets those nasty boogers little kids seem to get–but there was no way my fat fingers were going to fit. I left her on the couch, ran upstairs and grabbed some tweezers. In the next twenty minutes I proceeded to try everything I could think of to get that popcorn kernel out of her little nose. I blew into her mouth, blew into her nose, used tweezers and am sad to say a few other absolutely ridiculous things that I’m sure will wake her in a cold sweat when she hits college. Nothing doing, that thing was not going to come out. I knew I was going to have to take her to the emergency room. I really didn’t want to, not so much from the cost factor, but because she had two lovely bruises on her face, and having experienced the questions of hospitals when Austen had broken his leg–and I really didn’t want to go through that again. (For the record, she is extremely fair-skinned so any slight bruise looks pretty nasty. She had fallen out of her bed while reaching for a book one night and banged her face on the bookshelf–giving her a lovely green “Joker-esque” mark on her left cheek. Then she fell out of our bed two nights later and got a huge goose egg from banging her head on my bedside table. So she looked like she had been through the wars already.) I had no choice–I could not get that kernel out, and there was no way, in spite of her reassuring me with “The popcorn doesn’t bother me at all now, Daddy!” that I was going to leave it in there. Texted Robyn to tell her I was on my way to the ER, called my mom to come over and watch the other three, and hurried down the road to Valley General. Luckily, Autumn was pretty calm by this point–all the torture she’d gone through as I desperately tried to pull a popcorn kernel from her sinus cavity had been forgotten because of the promise of ice cream after the doctor visit. We did rehearse several times as to how she had acquired the bruises, in case anyone asked. When it was finally our turn to see the doctor, she had charmed her way through the entire ER. Her long blonde hair, cute smile, and the fact she was singing a made-up song to the Raiders of the Lost Ark theme, probably helped. Doctor Rob came in with a crazy syringe contraption, and although I was going to film the whole thing for later posting on my Facebook page, by the time they got to almost pulling it out, she was crying too hard–mostly from the fact that they had restrained her arms–and the father side of me gave in and I just held her and told her she was going to be fine. Through the syringe, eventual tweezers, and the amazing work of Dr. Rob, the kernel was eventually out. I was going to bring it home for posterity, but I dropped it somewhere in the ER. Every doctor and nurse made Autumn promise to never do it again. 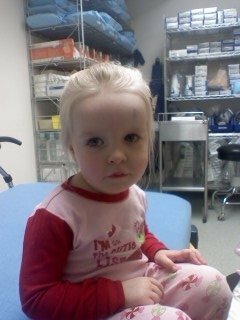 Of course, I think she heard me tell the nurses that at least it wasn’t as bad as when her brother broke his femur. Now I’m just a little nervous that her competitive nature might get the best of her. Maybe I’ll make her spend the next month living downstairs…just to be safe. And, of course, without any popcorn. 2 months ago I had the privilege of being chosen by Disney as one of 16 women of influence from around the country to preview the new Winnie the Pooh movie. When I received the email in mid-May, I immediately jumped at the opportunity. I mean, who wouldn’t want to be wined and dined by Disney? We were put up in a 4-star hotel, fed catered meals, driven around in limos, and met with Disney animators and legends. It was definitely an experience that will live in my mind forever. But one of the best parts of my 3-day adventure was getting to preview the new Winnie the Pooh movie. I have never been a huge Winnie the Pooh fan, so when news came out that a new “Pooh” movie was being released, my first thought was, “Great, another Disney ‘remake. 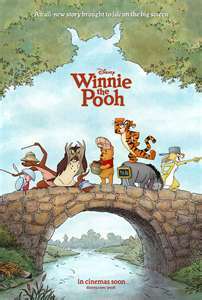 '” Luckily, I was thoroughly put in my place when I saw Pooh and his friends come to life on the big screen. This is not another Disney remake. It’s a whole new story with JUST the original Pooh characters. It is unlike the original movie in that it is fast-paced, funny, witty, and with more “grown-up” humor than the first. In fact when the movie ended, I was surprised and a little disappointed that it seemed over so quickly. With music done by Zooey Deschanel, this new Winnie the Pooh adventure is one that you and your kiddos will not want to miss! Go see it and give me your thoughts! I would LOVE to hear them!